Securing fast, inexpensive, and enforceable redress is vital for the development of international commerce. In a changing international commercial dispute resolution landscape, the combined use of mediation and arbitration has emerged as a dispute resolution approach which offers these benefits. However, to date there has been little agreement on several aspects of the combined use of processes, which the literature often explains by reference to the practitioner’s legal culture, and there is debate as to how appropriate it is for the same neutral to conduct both mediation and arbitration. Identifying the main ways of addressing concerns associated with the same neutral conducting both mediation and arbitration (same neutral (arb)-med-arb), this book examines how effectively these methods achieve the goal of fast, inexpensive, and enforceable dispute resolution, evaluating to what extent the perception and use of the same neutral (arb)-med-arb depends on the practitioner’s legal culture, arguing that this is not a ‘one-size-fits-all’ process. 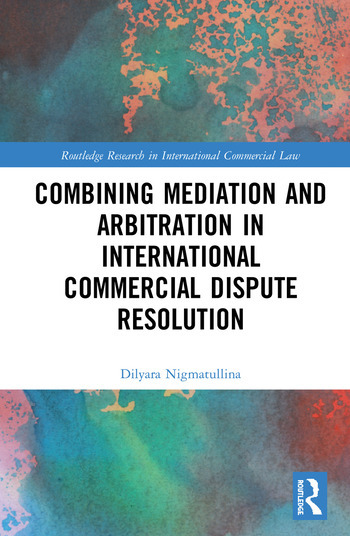 Presenting an empirical study of the combined use of mediation and arbitration in international commercial dispute resolution, this book synthesises existing ways of addressing concerns associated with the same neutral (arb)-med-arb to provide recommendations on how to enhance the use of combinations in the future. Dilyara Nigmatullina is an Arbitration and Mediation Consultant and an affiliated member of Academic Staff at the University of Antwerp Faculty of Law. She holds an LLM in International Commercial Arbitration Law from Stockholm University and a PhD in Law from the University of Western Australia.